Hillsborough Dukes Pop Warner Football and Cheer, a non-profit organization, is making plans for our upcoming season. Each season, approximately 200 local children participate in our football and cheer program. Pop Warner Football and Cheer teaches valuable life skills to our community’s youth, such as self-discipline, teamwork, friendship and good sportsmanship. We also encourage achievement scholastically through our Little Scholars Program, whose philosophy is: Academics and Athletics go hand-in-hand. I’m sure you're looking for opportunities to increase visibility and express your support for the community. 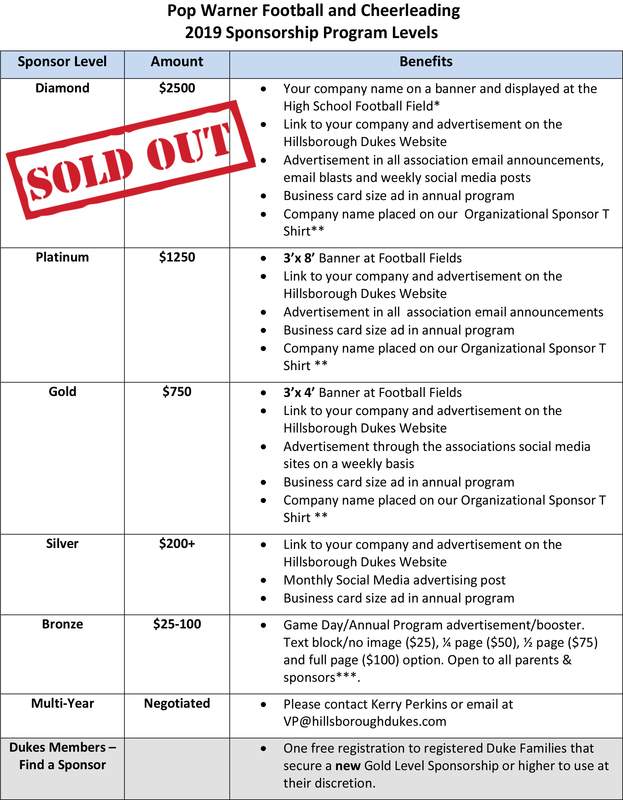 I'd like to share with you how sponsoring the Hillsborough Dukes can help your business while at the same time have a positive impact in the lives of local youth. We rely on the support of local business leaders like yourself to cover equipment, uniforms, insurance, officiating fees and the many operating expenses for this valuable experience for youth. In turn, sponsors receive exclusive exposure to the many parents in the Somerset, Hunterdon, and Middlesex County community. Your sponsorship will be seen by these parents who attend our games at the Hillsborough High School football field and other events throughout the year. Attached is our Organizational Sponsorship Form that outlines several levels of sponsorship. By sponsoring our football and cheer program, you'll have a captive audience exposed to your marketing message on an ongoing basis throughout the season. Your support can create awareness and goodwill for your organization, and you're likely to find that parents and other supporters find the idea of doing business with our sponsors quite appealing. In order to properly serve our sponsors we ask that all forms be submitted by July 1, 2019. This will give us sufficient time to produce the physical marketing materials to best showcase your sponsorship. Please feel free to contact me at vp@hillsboroughdukes.com if you have any questions.